Next year Princess Cruises is set to join the ranks of Royal Caribbean and Norwegian Cruise line by introducing a new cruise ship built and designed specifically for the Chinese market. Earlier this year Royal Caribbean took delivery of Ovation of the Seas, their first luxury cruise ship specifically designed for the Chinese market and in May 2017 Norwegian Cruise Line will take delivery of Norwegian Joy. Set to sail her inaugural voyage next year on April 4 Majestic Princess is Princess Cruises’ answer to a rising demand for luxury cruises in the Asian travel market. 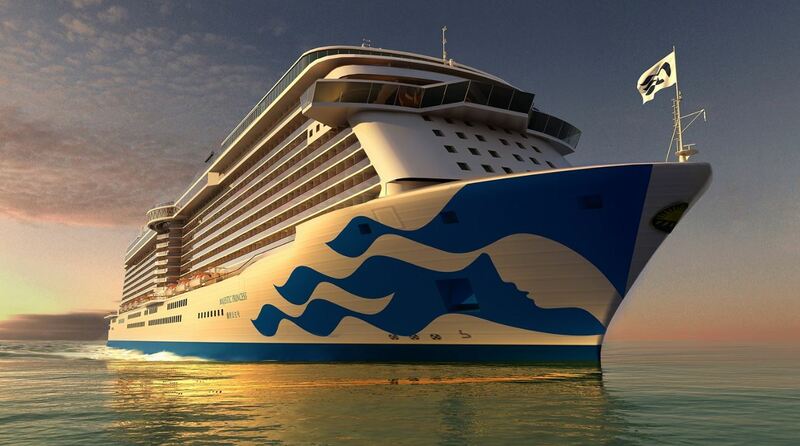 Majestic Princess, the newest sister ship to Regal Princess and Royal Princess, will be the first ship in the fleet to debut a new livery design featuring the company’s iconic “Seawitch” logo, one of the most recognized brand logos in cruising. The design symbolizes the “smooth and flowing gracefulness of ocean waves and represents the excitement and adventure of discovering the best the world has to offer on a Princess cruise vacation”. Majestic Princess will offer its guests a variety of enticing features and experiences with a Chinese flair. Majestic Princess will have some of the same popular culinary offerings from sister ships Royal Princess and Regal Princess. The exclusive Chef’s Table Lumiere, a unique and engaging dining experience personally hosted by the ship’s Executive Chef which includes a private galley tour and a multicourse dinner served at a grand custom-designed table where guests are surrounded by a glimmering curtain of light. The award-winning Crown Grill & Bar, an American steakhouse, serving top-quality cuts of beef, chops and seafood in an open-kitchen served in a classically elegant restaurant setting. Alfredo’s, named after Princess Cruises’ award-winning Master Chef Alfredo Marzi, offers a selection of classic Italian and signature Neapolitan-style pizzas along with baked pasta dishes and specialty appetizers and desserts. 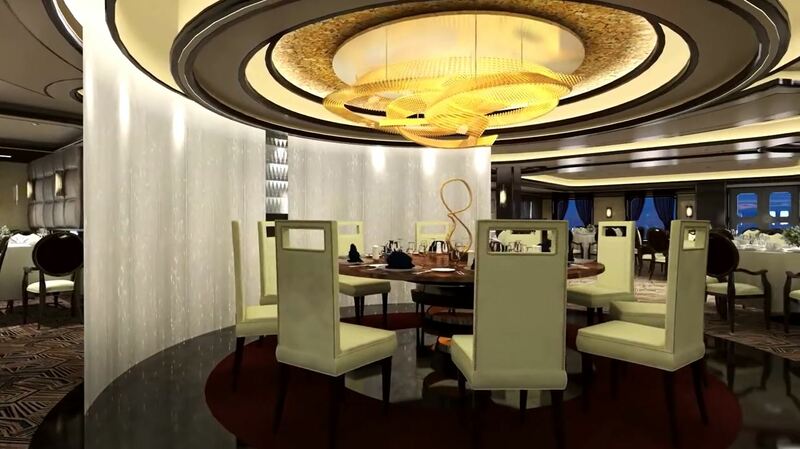 Furthermore Majestic Princess will introduce two new specialty restaurants, Harmony and Le Bistrot. Harmony, the Cantonese restaurant will offer Chinese haute cuisine paired with pristine ocean views and modern décor, while Le Bistrot, the new Parisian style bistrot will offer casual French home-style dining with a modern twist. The menu will feature traditional Escargots Casseroles, Braised Ox Tongue and Mushroom Ragout, along with baquettes, tartines, tourtes and French Patisseries. The World Fresh Marketplace (Horizon Court buffet on other ships), will offer a wide selection of all-day gastronomy where guests can taste flavors from from around the world, ranging from Mediterranean dishes, a pasta specialty counter, colorful farmer’s market salads and fresh fruits and a new “East Meets West” street food specialty counter. The Bakery inside the World Fresh Marketplace will serve Western, European and Asian pastries and Danishes. Influenced by fashion, art and history, the interior design of Majestic Princess will present a sophisticated and stylish visual experience representative of traveling the world. Exquisite designs using metal, glass and inlaid wood through-out will welcome guests who appreciate the elegance and glamour of premium cruising. European marble, mosaic tile floors, polished woods and sumptuous fabrics will be featured onboard the ship together with plush custom-designed carpets in the guest corridors with floral motifs that represent an Asian-inspired beauty and grace. Hand tufted area rugs also mirror floral motifs located at the entrances to the main dining rooms. With only 342 inside cabins, on a total of 1,780 guest cabins, more than 80 percent of Majestic Princess’ staterooms will include a private balcony. 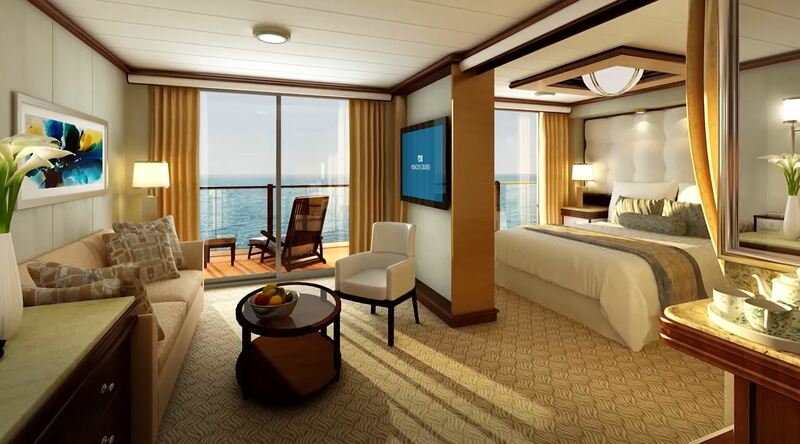 The rest of the staterooms include 716 Balcony cabins, 312 Deluxe Balcony cabins, 374 Mini Suites with private balconies and 36 Suites with private balconies. Showtime onboard Majestic Princess will include “Fiera” and “Fantastic Journey”, two shows that have been met with enthusiastic acclaim by audiences across the Princess fleet. These musical shows feature a world-class cast of singers and dancers along with some of the most elaborate production numbers, costumes and advanced multimedia stage technology. Furthermore the entertainment will feature “Movies Under the Stars” on the largest outdoor screen at sea, as well as “Water Color Fantasy”, a cruise industry first presenting a dazzling water and light show at sea. Onboard Majestic Princess, guests will also experience the signature over-the-ocean SeaWalk, the industry’s first glass floor walkway extending 28 feet (8 meters) beyond the edge of the ship, and SeaView Bar featuring “flair” bartending with the best views at sea. 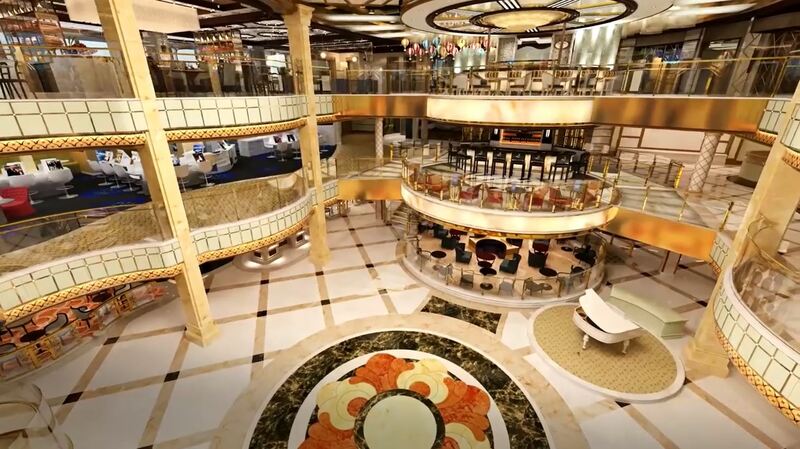 The Piazza Atrium, the central focal point of the ship features live entertainment throughout the day and evening. It is a grand spectacle surrounded by The Shops of Princess, almost 1,100 square meters of luxury boutiques which include designer brand shops from Cartier, Bvlgari and Chopard, leather goods from Burberry and Gucci, along with watches by these luxury brands as well as Montblanc, Longines, Rado and Tissot. Departing April 4, Majestic Princess will sail on her inaugural voyage, a five-day Adriatic Sea cruise roundtrip from Rome with stops in Kotor and Corfu. Following her maiden cruise, Majestic Princess will tour Europe, offering guests a chance to experience the ship on 7, 14, 21 and 28 day cruises departing from Rome, Barcelona or Athens. A repositioning voyage will depart Barcelona on May 14, 2017, visiting Dubai and Singapore before arriving in Shanghai, her new home. Majestic Princess will begin her first cruise from its home-port in Shanghai on July 11, 2017, carrying 3,560 guests to a variety of destinations in Japan and Korea.